One (1) 1902 US $5 and one (1) 1929 US $20 National Currency note, 2 items total. 1st item: $5 "Plain Back" bank note dated 1902 from the American National Bank of Nashville, Tennessee, depicting the portrait of President Benjamin Harrison, obverse. "The Landing of the Pilgrims", engraved by Charles Burt (Scotland/New York, c. 1823-1892), reverse. Third Issue. Serial # 224373/ pp V. CH # 3032. FR # 598. Lyons/Roberts signatures. 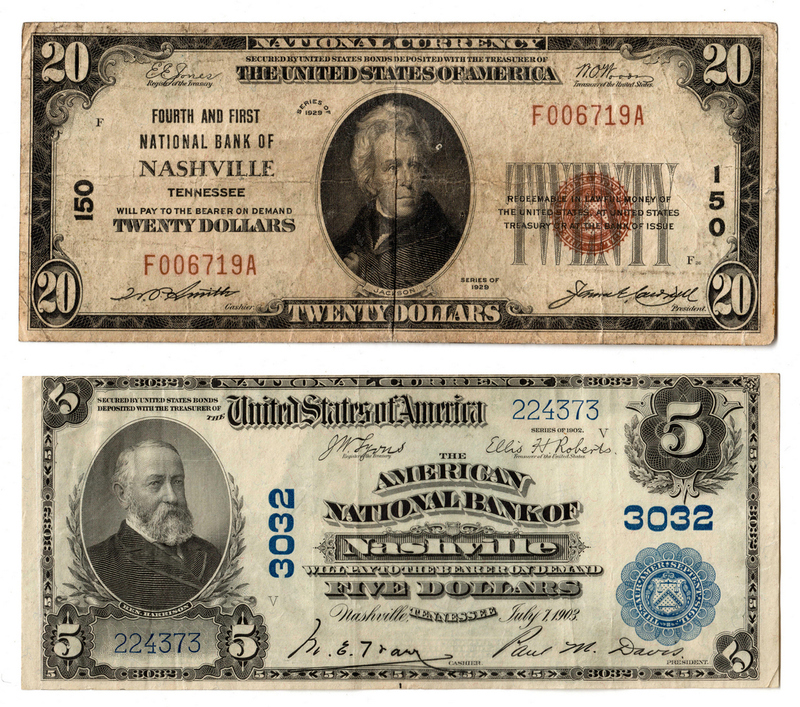 2nd item: $20 bank note dated 1929 from the Fourth and First National Bank of Nashville, Tennessee, depicting the portrait of Andrew Jackson, engraved by Alfred Sealey (New York, 1815-1868) after a painting by Thomas Sully (Pennsylvania/England, 1783-1872). Serial # F006719A/ pp F. CH # 150. Jones/Woods signatures. Provenance: the collection of the late James A. Newman (Nashville, TN, 1892-1964). CONDITION: 1st item: Very Fine condition. 2nd item: Fine/Very Fine condition.